SAN FRANCISCO, CA--(Marketwire - Feb 26, 2013) - FinancialForce.com, the cloud applications company, today announced the Winter '13 release of FinancialForce Professional Services Automation (PSA), a cloud-based solution that transforms how professional services (PS) organizations sell, resource, and deliver professional services projects. FinancialForce PSA Winter '13 reinforces FinancialForce.com's commitment to making PS teams more effective, mobile and social. Built on the Salesforce Platform and natively embedded with Salesforce CRM, FinancialForce PSA is one of the industry's fastest growing PSA solutions. Winter '13 is based on enhancement ideas submitted online by the company's growing community of users via the FinancialForce Community. 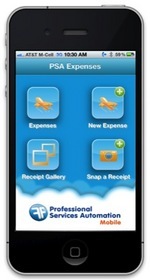 FinancialForce.com has delivered new capabilities in PSA Winter '13 to dramatically simplify expense entry and receipt capture via mobile devices. FinancialForce PSA Winter '13 also features a host of new innovations based on customer feedback to boost productivity and ease of use for services teams. FinancialForce PSA Winter '13 features a new mobile expense entry application which complements the existing FinancialForce PSA timecard entry application. The new app gives highly mobile PS workforces the tools they need to focus on customer service and satisfaction and minimize the time spent on administrative responsibilities. Mobile expense entry enables users to submit and track their expenses on their Android device, iPhone or iPad, taking photos of receipts and attaching them to expenses. Once submitted, expenses are immediately available for client billing and/or accounting for employee reimbursement. With everything centralized, PS professionals can access all the information they need to collaborate on the road, including via Salesforce Chatter, while getting their timecards and expenses entered anywhere, anytime. The FinancialForce Output Builder now offers automatic, scheduled project status reports. Output Builder can create project status updates directly from the data in the system, which can be automatically emailed to customers and stakeholders. In addition to keeping external and internal teams up-to-date, this capability also saves PS teams significant time and resources from the laborious process of gathering data manually, and assimilating the information into attractive and informative project reports based on the customers' needs. ClickLink, a FinancialForce Platform "click to integrate" tool now features Import/Export functionality to transfer integration rules and configurations between organizations. This allows integration rules to be shared between sandbox and live environments as well as sharing amongst the FinancialForce user community. Bulk Timecard and Expense Approval allows professionals to breeze through an often arduous process in bulk rather than manually manage approvals one by one. "For professional services teams, maximizing their business value for customers remains the top priority," said Christine Dover, Research Director at IDC. "Mobile expense entry, bulk approval and customized real-time reporting capabilities allow consultants and services professionals more time to focus on what's essential -- customer service and satisfaction." In addition, PSA Winter '13 includes dozens of productivity enhancements to reduce data entry, make resource assignments easier and allow more flexibility to adapt to changing project needs on the fly. "Manual and time-intensive administrative duties consume too much of a consultant's time, both personal and potentially billable time," said Jeremy Roche, CEO at FinancialForce.com. "This new release not only gives them an edge in mobile and social capabilities but it gives them back time to do what they do best -- delighting customers." FinancialForce PSA Winter '13 is available immediately to FinancialForce PSA users as part of their subscription fee. The Mobile Expenses Application will be available in the Apple App Store and Google Play within three weeks. To learn more, visit www.financialforce.com. FinancialForce.com is the cloud applications company. We build the #1 Accounting, Billing and Professional services automation applications on the Salesforce cloud platform. We serve fast-growing organizations and dynamic enterprises, helping them to align Finance, Sales and Service in a way that enables profitable growth. We are backed by two of the biggest and best players in the business, UNIT4 and salesforce.com. To learn more please follow us on Twitter @FinancialForce, visit our Facebook page or visit www.FinancialForce.com. FinancialForce PSA Winter '13 features a new mobile expense entry application which complements the existing FinancialForce PSA timecard entry application.